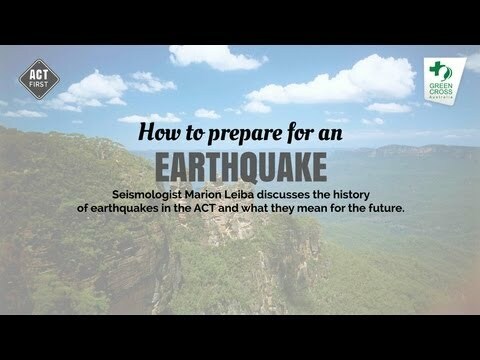 1/3 History of earthquakes in the ACT Marion Leiba talks about the history of earthquakes in the ACT. 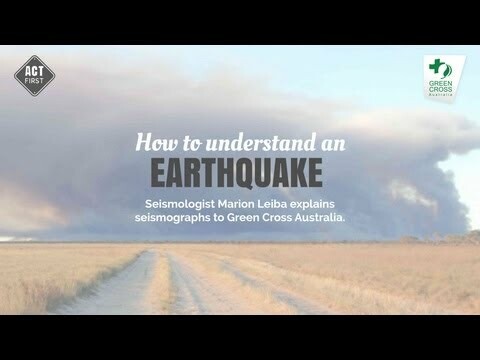 The Canberra region has experienced an average of one earthquake per year for the past 50 years; and for most residents this information would come as a surprise. 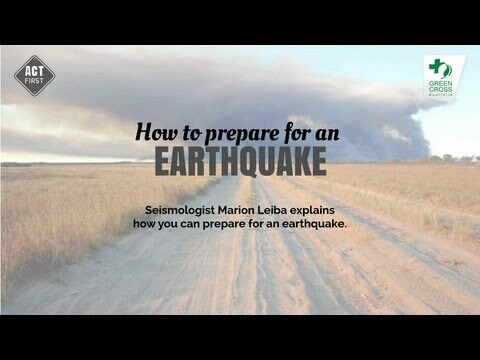 How is the size of an earthquake measured? The size or magnitude of earthquakes is determined by measuring the amplitude of the seismic waves recorded on a seismograph and the distance of the seismograph from the earthquake. These are put into a formula which converts them to a magnitude, which is a measure of the energy released by the earthquake. For every unit increase in magnitude, there is roughly a thirty-fold increase in the energy released. For instance, a magnitude 6.0 earthquake releases approximately 30 times more energy than a magnitude 5.0 earthquake, while a magnitude 7.0 earthquake releases approximately 900 times (30x30) more energy than a magnitude 5.0. A magnitude 8.6 earthquake releases energy equivalent to about 10 000 atomic bombs of the type developed in World War II. Fortunately, smaller earthquakes occur much more frequently than large ones and most cause little or no damage. Earthquake magnitude was traditionally measured on the Richter scale. It is often now calculated from seismic moment, which is proportional to the fault area multiplied by the average displacement on the fault. The focus of an earthquake is the point where it originated within the Earth. The earthquake epicentre is the point on the Earth’s surface directly above the focus. The amplitude of the shaking caused by an earthquake depends on many factors, such as the magnitude, distance from the epicentre, depth of focus, topography, and the local ground conditions. Earthquake effects, as noted by people, are rated using the Modified Mercalli (MM) intensity scale, which ranges from I (imperceptible) up to XII (total destruction). If the people or buildings are on soft ground such as old river sediments, the MM intensity experienced may be one to two units higher; if on solid rock, it may be one unit lower. The intensity with which the earthquake is felt may also be higher on hilltops. In Australia, earthquakes with magnitudes of less than 3.5 seldom cause damage, and the smallest magnitude earthquake known to have caused fatalities is the magnitude 5.6 Newcastle earthquake in 1989. However, magnitude 4.0 earthquakes occasionally topple chimneys or result in other damage which could potentially cause injuries or fatalities. Apart from causing shaking, earthquakes of magnitude 4.0 or greater may also trigger landslides which can cause casualties. The larger the magnitude of the earthquake, the bigger the area over which landslides may occur. In areas underlain by water-saturated sediments, large earthquakes, usually magnitude 6.0 or greater, may cause liquefaction. The shaking causes the wet sediment to become quicksand and flow. Subsidence from this may cause buildings to topple, and the sediment may erupt at the surface from craters and fountains. Undersea earthquakes can cause a tsunami, or a series of waves which can cross an ocean and cause extensive damage to coastal regions. The destruction from strong earthquake shaking can be worsened by fires caused by downed power lines and ruptured gas mains. Canberra lies within a broad NE-SW trending belt of epicentres. The largest events recorded in this zone were of Richter magnitude ML 5.6, the same size as the December 1989 Newcastle earthquake. Small earthquakes occur under Canberra's suburbs but the nearest active seismic zone is 60 km north of Canberra in the Dalton – Gunning area, NSW. The rocks of the Canberra region are mainly metamorphosed Middle to Late Ordovician sedimentary and Silurian igneous and sedimentary rocks, ranging in age from about 408-468 million years. They have been subjected to several periods of reverse faulting, that is, the lower older rocks were thrust up and over the younger ones, on north-south faults, some of which may be as old as the Late Silurian. Frequency of occurrence of earthquakes within 20 km of Canberra GPO Seventy-two earthquakes occurred within 20 km of the GPO in the 36 years prior to the end of 1995, and during this period yearly numbers varied between zero and nine with a mean number of 2.0. During the period January 1996 to November 2007, 30 earthquakes with Richter magnitudes 1.0-2.5 occurred within this same area, giving a mean number of 2.5 earthquakes per year. "Emergency services received more than 500 calls for help after yesterday's rain storm lashed Canberra." As the heatwave continues throughout the region, Canberrans are urged to keep cool, drink plenty of water and look out for vulnerable residents. Canberra residents have been urged to review their bushfire survival plan as a grass fire in Jerrabomberra fire is brought under control. Read the full article on the Canberra Times. "Of the thousands of calls the ACT SES respond to each year, about half could have been avoided if property owners had taken some precautions," reports Jim Trail of ABC 666 Canberra. The Canberra Times has covered the official launch of ACT First, reporting that, "Too many Canberra residents are failing to take simple steps to safeguard their families and properties against storms and floods." The bushfires have begun already and prompted questions about the region's preparedness for such a long fire season. The ACT is nicknamed “bush capital” for a reason – we have encouraged the bush to grow without out city, which means our suburbs and rural areas are exposed to bushfires. The Canberra region has experienced an average of one earthquake per year for the past 50 years; and for most residents this information would come as a surprise. Frequency of occurrence of earthquakes within 20 km of Canberra GPO Seventy-two earthquakes occurred within 20 km of the GPO in the 36 years prior to the end of 1995, and during this period yearly numbers varied between zero and nine with a mean number of 2.0. Flash floods can occur almost anywhere there is a relatively short intense burst of rainfall such as during a thunderstorm. As a result of these events the drainage system has insufficient capacity or time to cope with the downpour. Although flash floods are generally localised, they pose a significant threat because of their unpredictability and normally short duration. 105 people have been killed by landslide events since 1842 in 100 recorded landslide events (National Landslide Database, 2007). Many of these events resulted from natural phenomenon, though half of those causing death and injury can be attributed to human activity. "Resource encourages residents to ACT First", reports Canberra Weekly's Allison Redman. "The ACT was buffeted by gale-force winds and torrential rain on Wednesday afternoon, with the territory receiving its monthly rainfall in just three hours." Severe heatwaves were once expected to hit Canberra about once every 25 years, experts say, but the sweltering conditions will be the third such hot spell in the capital in four years. The Canberra Times reports the blistering heat is a sign of things to come, with the CSIRO predicting ACT residents could suffer through 26 days a year with a top temperature of 35 degrees or more before the end of the century. The Canberra Times reported that authorities acted quickly to put out two fires in 12 hours over the hot holiday season. "Green Cross Australia's Act First site helps ACT residents prepare for disasters via Zeroseven," Campaign Brief's Rikki reports. A community of ACT social media users will add to front-line preparations this year to prepare Canberrans for their next natural disaster. Read John Thistelton's report from the Canberra Times on the launch of ACT First. Climate change means a change in the average pattern of weather over a long period of time. To understand climate change, first you must understand the difference between weather and climate. Storms can happen anywhere, but they are more common in the ACT from September to end of February. Severe storms are more common than any other natural hazard and are responsible for more damages measured by insurance costs than bushfires, floods or cyclones. A simple definition of flooding is water where it is not wanted. The supercell thunderstorm that resulted in the tragic 1971 Woden Flood shows how deadly floods can be. During a ‘heatwave’ temperatures are above average for several sequential days and it remains hot overnight. Heatwaves have caused more deaths than bushfires in Australia, and cause losses to crops, livestock and infrastructure. Many people believe that tornados do not occur in Australia; this is not true, they do and have caused numerous deaths. Most thunderstorms do not reach the level of intensity needed to produce these dangerous phenomena, but they all produce lightning which can cause death, injury and damage. Tornados can and do occur in the ACT.